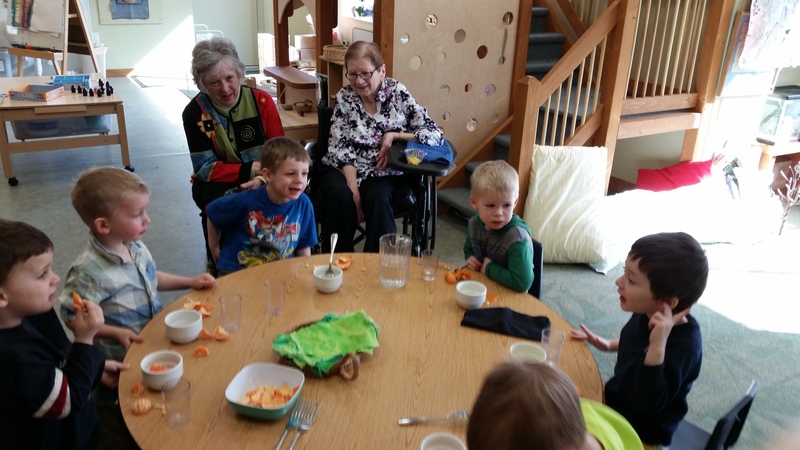 In my first year working at an intergenerational preschool, I perceived a large part of my role to be a bridge builder between the residents and the preschoolers. Close relationships amongst those two cohorts would be the surest measure of success. It wasn’t long before I was confronted with the realization that I was more than an engineer, and not immune to the joy of connecting with the grandmas and grandpas. My heart grew three sizes, and it was clear the preschooler’s lives had been enriched in countless ways. But what about the person we spent the most time with, our senior reader? 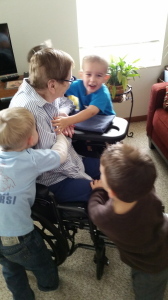 What was Grandma Bette’s take on spending time with the Spring Room children? Not knowing Bette yet, I chose books that were short and simple, with large print. I didn’t want her to feel uncomfortable, yet I didn’t want to underestimate her abilities. There was plenty of dancing back and forth those first months. In that time, we went from The Carrot Seed to books with intricate plots and small print. Bette once stated matter-of-factly, “That’s what glasses are for.” We quickly figured out what the boys loved best was to share with Bette the books that we had previously read in class. Already knowing what was to come, their excitement to share twists and climaxes grew as the pages turned. Rather than the illustrations, they watched for Bette’s reactions. Now Grandma Bette knew all about Miss Suzy and the invading squirrels too! You could hear the boys exhale with relief when we were all back on the same page. I was so worried about Bette’s perception of us. Was she bothered when the boys made goofy faces in her full-length mirror and left finger (and tongue) marks? What about when they started to open drawers, or play with the electronic lift on her recliner? Turns out I was the one who needed to relax. Visiting Bette’s apartment got better when we struck a balance between being respectful and me letting the little things go – the little things that were spurred on through curiosity in the first place. “There isn’t anything the kids did that bothered me.” And me oh my, with Bette’s blessing we’ve just about burned out the motor on that lift chair. Bette has since started playing blackjack – something that I can’t help but think was sparked by taking a risk as a preschool reader. It is a short leap from having someone hold the book to having someone hold her cards. She shared rather bashfully that she has since won the trophy three months in a row. She has a trophy, but we hit the jackpot.